The Buffalo State community proudly welcomes the families of the Class of 2019 in celebrating their graduates' accomplishments during the 147th Commencement ceremonies and receptions on Saturday, May 18 on the Elmwood Avenue campus. 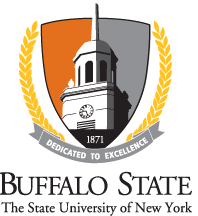 Commencement 2019 honors Buffalo State bachelor's degree, master's degree, and certificate of advanced study (C.A.S.) graduates who complete their requirements in December 2018 or January 2019 or whose academic records show they anticipate completing their requirements in May 2019 or August 2019. Ceremonies are held in the Buffalo State Sports Arena. Guest tickets are required for entrance. Master's/C.A.S. graduates may receive 10 tickets for their ceremony. There is no fee for tickets. Celebrates the master's degree and certificate of advanced study candidates. Live ceremony streaming of the undergraduate ceremonies (9 a.m. and 1 p.m. only) for guests who do not have entrance tickets takes place in the Campbell Student Union Social Hall. Tickets are not required. The seating maps by ceremony are posted above to help families determine the general areas graduates will sit by academic school. Graduates will process into the Sports Arena first, followed by faculty marchers, concluding with the Platform Party that includes President Katherine Conway-Turner, Provost Melanie Perreault, speakers, award recipients, SUNY and other dignitaries, and the academic deans. During the ceremony, graduates names are announced individually as they walk across stage, are congratulated, and receive a congratulatory certificate and keepsake scroll. Graduates return to their seats for degree conferral and Class of 2019 congratulations. Guests may not approach the stage or graduate seating areas. TIP: For photographing your grad. See Capturing the Moment. The ceremony closes with the singing of the Buffalo State Alma Mater, led by the Buffalo State Chamber Choir. Families are asked to remain seated throughout the ceremony and until all faculty marchers and graduates have recessed from the arena. Graduates will recess out the back of the arena on the Grant Street side. Once they have exited, guests may leave their seats and meet their grads outside. TIP: Where to meet your grad. Families and grads arrange a predetermined meeting spot outside the arena. Guests in the live stream viewing area will already be in the reception area. Bachelor's degree graduates and their guests are cordially invited to a festive reception featuring live music and refreshments immediately following both the 9 a.m. ceremony and the 1 p.m. ceremony. The celebration is held in the Campbell Student Union. Tickets are not required and all may participate. This is a great opportunity to gather, celebrate, take photos, and meet your graduate's professors and mentors. Master's degree and certificate of advanced study graduates and their guests are invited to a celebration in their honor immediately following the 5 p.m. Graduate School Ceremony in the second floor reception area of the Sports Arena (adjacent to the Ice Arena). Gather with graduates and faculty for a festive reception with live music, hors d'oeuvres, refreshments, and plenty of mixing and mingling. TIP: For timing Restaurant Reservations. Each Baccalaureate ceremony runs approximately two hours, and the Graduate School ceremony runs about 2 hours. Plan an hour or more after your ceremony for photos and the reception plus travel time when making restaurant reservations. Families and friends, please utilize this website as your source for planning for your graduate's Commencement day. The links to the left will continue to be updated as plans progress and will direct you to information of particular interest to families. An informational mailing will be sent to all eligible students at their permanent addresses during spring break. Should you require further information, please use the Helpful Contacts page. The faculty, staff, and administration of Buffalo State look forward to your joining us in celebrating the Class of 2019 on Commencement day.